From table scraps to tinsel on the tree, certain items around your house may be unsafe for your dog during the holidays. Here are the top 10 holiday pet hazards and how you can reduce the risks. Any chocolate is off-limits for pets. The darker the chocolate, the more dangerous it is to pets. Baker’s chocolate is the most toxic. Theobromine and caffeine are the toxic ingredients. Curious dogs may sniff, paw, and pull the tree over on themselves. The best solution is to anchor your tree. You can use wire to secure the top of the tree, then run the wire up to the ceiling or the wall and secure it. Additionally, the tree preservative often put in the water around the tree trunk can cause gastrointestinal problems, so make sure your dog does not drink it. Poinsettias get the bad rap as the most poisonous, when actually they are fairly low on the toxic scale. But eating them may still cause some gastrointestinal upset. Other problematic holiday plants to keep out of reach: Christmas cactus, mistletoe, holly, cedar, balsam, and pine. Rich, fatty foods are often holiday favorites, but they can result in life-threatening pancreatitis. Anything salty, spicy or greasy qualifies. Bones from chicken or turkey can splinter in the stomach. Keep table scraps out of reach, and be sure the garbage isn’t accessible to your pet. 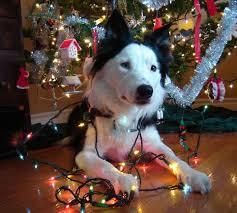 Small decorations and tinsel hanging low on the tree can be gobbled by pets, resulting in intestinal blockage. Avoid hanging tinsel and ornaments close to your pet’s eye level. Slipping a dog alcoholic beverages to see how they act when inebriated isn’t funny, and could be very dangerous. It can make them very sick, with vomiting and diarrhea. Certain foods on the dangerous list all year may be more plentiful around the holidays – or your guard may be down. Be sure your pet has no access to coffee grounds, grapes, raisins, onions, chewing gum or mints with Xylitol. This sweetener, also used in baked goods and candy, is associated with liver failure and death in dogs, according to the AVMA. Some pets simply aren’t comfortable around a lot of people. Some get scared while others get hostile. If your dog tends to be party-shy, put her in a spare bedroom with food and water, out of the way of guests. Say you’ve got company – maybe guests who aren’t used to keeping track of pets – and someone leaves the door open and out goes your pet. Besides alerting guests to your furry escape artists, make sure you have a way of finding your pet. A microchip, a rabies tag, or an ID tag with your contact information and the vet’s contact information will help bring the escape artist home. Crumpled up aluminum foil with food sticking to it can be irresistible to a dog. If swallowed, though, it can cause puncture wounds in the gastrointestinal tract. Keep foil safely out of reach of your pet. The holidays can be a busy time, but it’s also a time to reconnect with your family, friends, and pets. Have your vet’s contact information on hand and take the proper precautions to ensure everyone has a safe and happy holiday season.